Looking for a quick and easy gluten free chocolate cake? This one is so simple that you can make it one pot and it doesn’t need a drop of frosting. I’m hooked on this thick, fudgey, yet cakey treat. I made it a couple of weeks ago during our Super Bowl party and it was gobbled up in mere minutes by our boisterous gang of guests. If you are not in the mood for white chocolate, or wish to make a more Paleo/Primal treat, replace the white chocolate chips with dark chocolate chips. Replacing the white chocolate with dark chocolate turns this dessert into a healthy treat with high fat coconut milk (great fat to anchor your blood sugar levels) as well as almond flour and eggs (full of good proteins that also anchor blood sugar levels and keep you satiated). 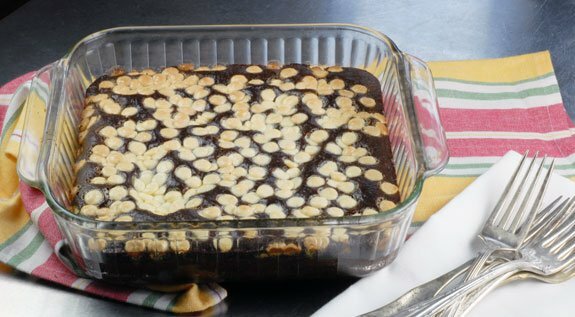 The recipe below is actually based on a brownie recipe by the lovely Marinka. When I posted my Double Chocolate Walnut Brownies, she left a comment with a link to her brownies, which I then in turn based this cake upon. Holy Moly! A humongous hit! In terms of substitution questions, feel free to try this replacing the eggs with some other ingredient of your choice. If you replace the eggs, or any other ingredient in this recipe, for that matter, please leave a comment and let us know how it goes! It took me quite a few tries to get this recipe just so, therefore I’m really not sure how it would work with various adaptations –the only way to find out is to give it the old college try. Elana! I have been following your site for years and years! This IS my favorite cake! So I started doing Keto after your posting of some recipes. I became curious and felt this is right up my alley. Doing it vegetarian style tho! After 4 months on, life happened and I got off track but still maintaining the weight loss that I have succeeded in keeping off. But man I loved good baked goods! Recently a coworker made miracle bars. HOOKED! Ok ok ok I have to find a work around but still get the crunchy nuts and chewy coconut flakes in a sugar free version … ta da! I melted 85% organic chocolate, added a couple squirts of vanilla flavored Sweet Drops (stevia) … poured it into a 9×13 and layered hazelnuts, pecans, unsweetend coconut flakes, white chocolate chips on top of cake. Pressed down a bit to glue them in. OMG I cannot wait for them to come out of the oven in 10 mins! It already looks amazing!!! Bless you for your journey and allowing me to tag along to soak up all your wisdom and awesome cooking/baking skills! Elana, I have made this cake so many times I know it by heart. It has been birthday cake for me and my kids for years, I’ve taken it to countless potlucks, and it is a hit every single time. Thank you for sharing this incredible recipe! Elana, this is my go-to recipe whenever I am craving something chocolatey and fudgy! The last time I made this recipe I did not have enough white chocolate chips but instead added almond butter and it was delicious!! Thank you for sharing your amazing recipes! I have made this cake a few times, but every time I get a different result. The first time I made it years ago it was delicious. I’ve tried since then and for some reason can not replicate it. Today I tried again and the issue this time is that the almond flour never really seemed to come together and the cake came out grainy and wet. It tasted good, but was a mush! Do you have some tips on what I may be doing wrong? Brittany, thanks for letting me know this cake was an amazing hit at your nephew’s birthday! Elana, do you ever make this cake into cupcakes??? How does it work in the CO altitude? Do you have another recipe you like to use for cupcakes? Everyone loved this cake!! Even my teenage kids! My husband said it was out of the park!! Debbie, so great to hear that everyone loved this! Dora, so glad to hear you say the cake is outstanding and that it made you a rock star with your SIL! Holy Moly this is the best cake I’ve ever made or eaten!!! I used a variation of cow’s milk, flax eggs and just milk chocolate chips and made 9 cupcakes in about 20 minutes and they were a humongous hit! They were allergy friendly for a 7 year old and she even said it was the best cake she ever had! I had to fight the adults off of her cake to take home with her! :-) Thank you!! !